At WireBarn we sell only the finest USA made Multi-Stranded Copper Wire, Automotive Primary Wire, AWM / Machine Tool Wire, Hookup Wire, plus great wiring tools and accessories. We carry High Temperature GXL Wire, TXL Wire, and UL 1015 AWM / MTW / Machine Tool Wire. 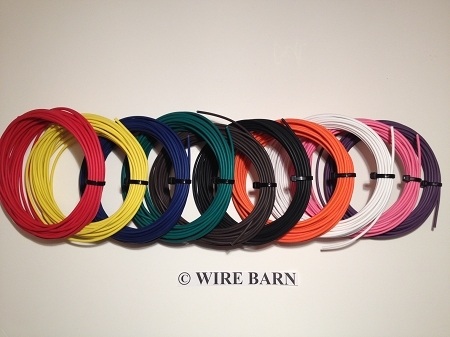 Ten (10) different colors of USA Made 18 AWG GXL High Temperature Automotive Grade Electrical Wire - 25 Feet Each Color. NOTE: Does not come on a spool - comes in small bundles. Copyright WireBarn. All Rights Reserved.